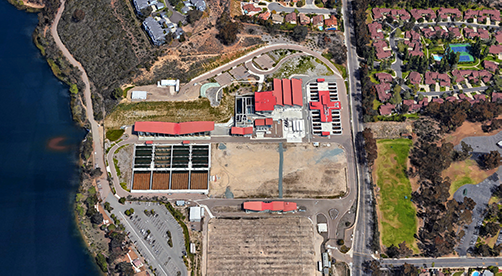 MWH Constructors was selected by the City of San Diego to provide third-party construction management, monitoring, administration and inspection services for the Miramar Water Treatment Plant (WTP) Upgrade and Expansion. The $180M project consisted of six elements: two early start improvement phases followed by four construction contracts. Phase I of the early start improvements consisted of initial project components of the WTP perimeter to accommodate the upgrade and expansion. This included a 70-ft-deep, 1,600-ft-long, 84-in-diameter pipeline tunnel that crossed beneath San Diego County Water Authority (SDCWA) aqueducts, 54-, 48-, and 36-in pipelines, a valve vault structure and initial improvements to the existing Miramar Lake raw water pump station. Phase II of the early start improvements included an 84-in treated water pipeline, a 90-in raw water pipeline, new connections to the SDCWA aqueducts, further improvements to the raw water pump station and improvements to the Miramar Lake recreation area. The final phases expanded the existing WTP capacity from 140 to 215-mgd, and included a deaeration basin, rapid mix facility, ozone system, 12 new filters, two new flocculation and sedimentation basins, new chemical feed system and a new administration building. The facility also included a tunnel under an existing flocculation sedimentation basin for a 72-in treated water pipeline. One million-man hours and over nine years of construction successfully completed with only one single lost time accident.